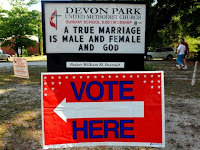 Since Amendment One's passing in North Carolina, I have seen dozens of letters which support my assertion that this vote was all about religion. 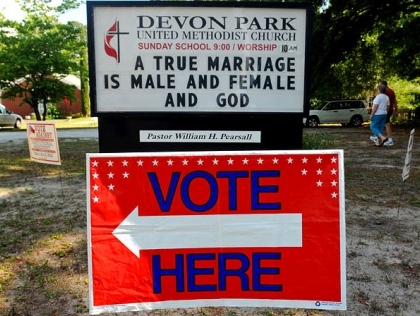 The passing of Amendment One was a protection of marriage, which God created. Many people are upset with Christians wanting this protection. Marriage is and always was between a man and a woman. Christians get their direction and information from the Holy Bible. 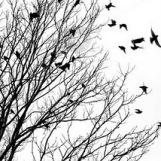 God did not leave his creation without direction. When people try to take matters into their own hands (or definitions ) they get themselves into problems. Many want to do just what they want to do. They will not listen to instruction. Variations of this letter have appeared in countless newspapers across the country to support anti-LGBT sentiment. These folks can repeat this refrain over and over -- and they certainly have the right to say (and believe) it -- but the fact of the matter is that this refrain is historically wrong, and a terrible basis for legislation. Sorry, folks, but you are not allowed to start the timeline at the point in history that helps make your case. If you ate a dozen donuts, you can't say you only ate 4 just because you didn't like how the first 6 tasted. Marriage has absolutely not always been between a man and a woman. Over the course of human history, marriage has been defined as between a man and several women, a man and an adolescent boy (Greece), a man and a man, a woman and a woman, every woman in the community and every man in the community (Oneida Colony, New York, 1848), etc., etc. The point? Marriage has evolved over time, and will continue to evolve until mankind is extinct. When you say that marriage has always been between a man and a woman, you are, quite simply, lying. Your god no more created marriage than any of these gods created marriage. In fact, we know for a fact that marriage existed prior to the emergence of monotheism. How is it that thousands of years of marriage existed before the emergence of the god that created it? Humans evolved. Religion evolved. Marriage evolved. Humans will continue to evolve. Religion will continue to evolve. Marriage will continue to evolve. It's pretty simple. When people such as the above letter writer start explaining that the 'Christian Bible' explains this or that about marriage, it might behoove those people to realize that one of our most important rights as Americans is that we can practice whatever religion we choose (and that includes the right to not practice one at all). I should no more expect your rights to be defined by my religious beliefs than you should expect my rights to be defined by yours. Freedom of religion does not mean that you are free to restrict the rights of others who do not accept the claims of your religion. It doesn't matter what the majority of Christians believe. What matters is that each American should not have his or her rights defined by a particular set of religious beliefs.